Justice of the Supreme Court Elena Kagan in conversation with Harvard Law School Dean Martha L. Minow Thursday. 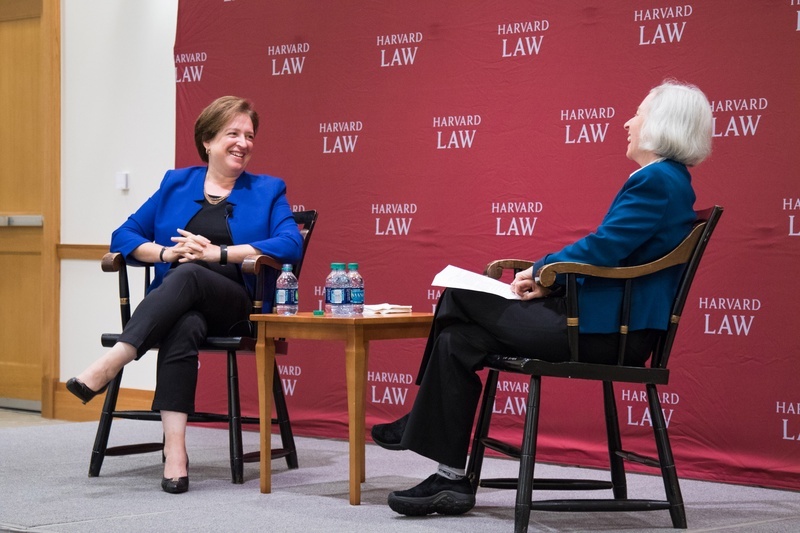 Supreme Court Justice and former Harvard Law School Dean Elena Kagan returned to her old stomping ground Thursday to reflect on her experience on the bench and and impart advice to incoming students. A crowd of mostly first-year and Masters of Law students packed the Milstein Conference Center Thursday afternoon to hear Kagan take part in a question-and-answer session with Law School Dean Martha L. Minow. Kagan, who graduated from the Law School in 1986, returned to the school as a professor in 1999 before becoming dean in 2003. She held the position until 2009, when President Barack Obama appointed her United States Solicitor General, and then to the Supreme Court in 2010. During her tenure as dean, Kagan expanded the faculty, oversaw construction of the school’s student center, implemented a major overhaul of the curriculum, and—as Minow pointed out to cheers from the audience—introduced free coffee for Law School affiliates. Serving as a Supreme Court justice is a narrower, more predictable job than that of a law school dean, Kagan told the audience as she reflected on her time. The justice alternated solemnity with well-received humor in her responses to Minow’s questions. She contrasted her job as dean with serving on the Supreme Court, described the difficulties of an eight-person court, recounted fond memories of former Supreme Court Justice Antonin G. Scalia, and poked fun at her responsibilities as the court’s youngest justice. Kagan jokingly complained to students about the “special duties” she is required to perform as the junior Justice, which include overseeing the Court’s cafeteria committee. “You get onto this court and you think you’re an important person, but then you have to spend over an hour a month thinking about chocolate chip cookies,” she said. On a more serious note, Kagan described the challenges of a split court. Scalia’s death in February—and the subsequent refusal of Congress to approve federal judge and Harvard Law alumnus Merrick B. Garland ’74 as his replacement—left the country’s highest court with just eight members. The justice spoke of her friendship with Scalia, with whom she became close despite holding widely-diverging positions on politics and the law. 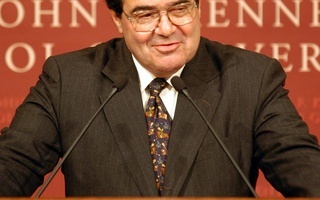 The two went on hunting trips together to Wyoming and Virginia in their free time, and last November, Kagan returned to the Law School to deliver the annual lecture named for Scalia. Kagan concluded the event by urging new Law students to use their time at the school to engage with classmates with whom they disagree. First-year student Michael Lemm appreciated Kagan’s advice, and said he was glad she recounted her friendship with Scalia. Lemm said the friendship demonstrated the importance of engaging with people with varying viewpoints. Kagan is a role model for Aaima Asad, an LLM student from Pakistan who attended the event. Kagan was the first female dean of the Law School, and the first female Solicitor General of the United States. Supreme Court Associate Justice Elena Kagan discussed what she described as “remarkable” changes in interpretation of statutory law in a conversation with law professor John F. Manning ’82 during an event at the Law School on Tuesday.